Spray Around is the revolutionary new sprayer that assures that you never lose spraying power no matter what angle you tilt your spray bottle. 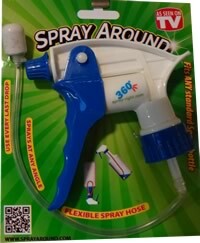 Spray Around is specially designed to use every last drop of liquid in the bottle. The weighted tip at the end of the tube simply follows the water and enables the user to spray at any angle. Most sprayers stop working when half full but Spray Around allows for spraying at 360 degrees. Spray at any angle down to the last drop with out ever losing spraying power! Patented flexible dip tube goes where the liquid goes! Weighted tip stays submerged at any angle you spray - even upside down! Each nozzle fits almost any conventional spray bottle. Buy 6 packages for $29.99! Check out our new item that will also Make Life Better: Super Rope Cinch!